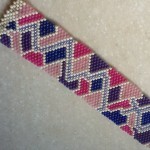 Learn how to create a Patchwork Cuff using a Flat Peyote technique. Finishing and closure techniques will also be discussed. Must have previous knowledge in the peyote technique.